Southwark Council has been ordered to disclose the financial viability assessment provided by developer Lend Lease to secure the approval of its Heygate masterplan application. This assessment justified the reduction in the affordable housing requirement from 35% to 25% and the reduction of social rented housing to just 71 units. 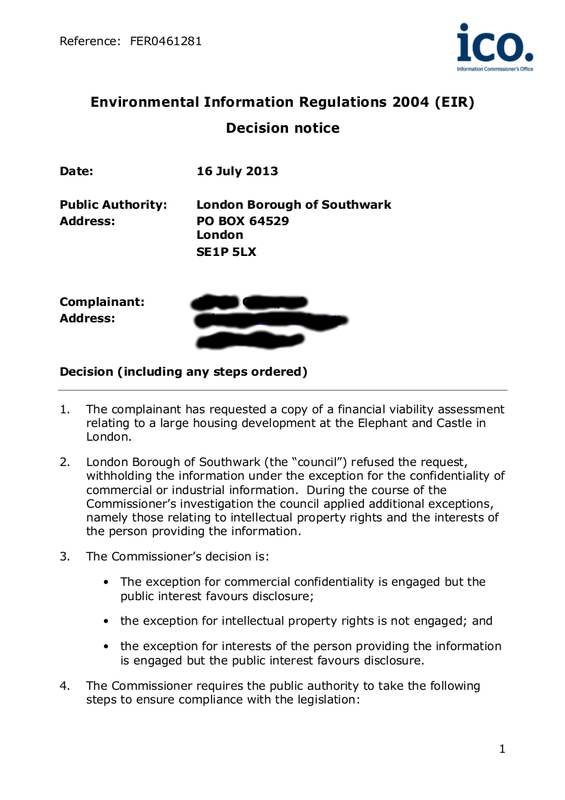 A Freedom of Information request for the viability assessment was rejected by Southwark Council, but the council’s decision has now been overturned by the Information Commissioner who has given Southwark 35 days to produce the assessment. The Commissioner’s report is a closely argued and detailed 35-page document. It draws upon previous decisions made both by the Commissioner and the Information Tribunal to come to its conclusions. The number of Heygate residents affected by the scheme (3,000) and subject to rehousing and Compulsory Purchase Orders. The loss of council-owned property through sale of public land to a private enterprise. Public concern about the level of affordable housing provided by the scheme and how this sits with the council’s Core Strategy. He notes the press and television attention that the development has received, and considers that the focus of public debate and concern has been on the levels of affordable housing provision delivered by the scheme. Disclosure of the viabilty assessment would inform this debate and reassure the public that the council’s decision to allow Lend Lease’s proposals to proceed were based on a correct analysis of the facts presented. He also notes the concerns raised by various community groups and on websites such as Southwark Notes, 35percent.org, and Spinwatch.org. Southwark can demonstrate its commitment to transparency and accountability by accepting the Commissioner’s decision without further ado. There will be more viability assessments submitted in the future - local councillors, planning committee members, and members of the general public must be able to see them, particularly if council policy is not being fulfilled. It is ridiculous that the masterplan planning application was passed blind by the planning committee - it dents Southwark Council and Lend Lease’s credibility, and local people’s confidence in the regeneration process. The South London Press reports that Southwark maintains that the assessment should not be made public and that it is “seeking further advice to determine its best course of action”. Every one of our elected councillors - regardless of which party they are in - should say different and insist that the viability assessment is released without further delay.